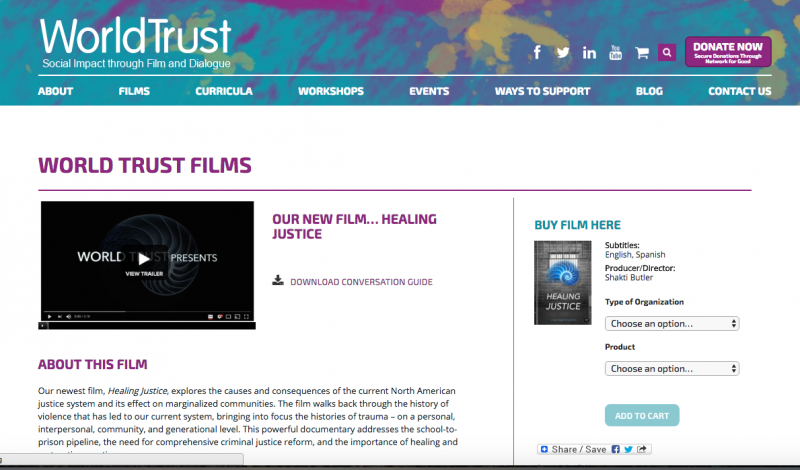 Our newest film, Healing Justice, explores the causes and consequences of the current North American justice system and its effect on marginalized communities. The film walks back through the history of violence that has led to our current system, bringing into focus the histories of trauma – on a personal, interpersonal, community, and generational level. This powerful documentary addresses the school-to-prison pipeline, the need for comprehensive criminal justice reform, and the importance of healing and restorative practices. From the larger structure of the legal system, to how we treat youth in our communities; what are the alternatives to these models of addressing conflict? This message about healing instead of further harming is so profound and so important. In a world where people constantly want to look to blame and punish, and yet gain no lasting benefit or lasting satisfaction, we need to hear this message of healing loud and clear. And we need to act on it now! That is why I continue to advocate for Restorative Practice whenever and wherever I can.